Well, the 14-18 year old youth in our Stake this past week spent some time walking around in the shoes and in the skin of some of their actual or adopted ancestors – the Mormon Pioneers. They spent three days in the mountains east of Cedar Hills re-enacting portions of the pioneer’s westward trek from Nauvoo, Illinois to Salt Lake City, Utah during the 1840’s and 1850’s. The youth spent some time before their “trek” researching their ancestors and finding stories of how these ancestors joined the Church of Jesus Christ of Latter-day Saints and learned of the difficulties they faced in their life. 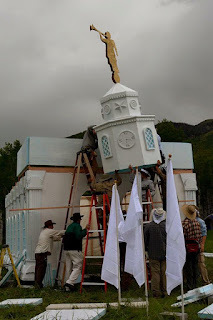 On the first day of Trek, the youth participated in building a replica of the Church temple in Nauvoo. The replica was 24’ x 16’ and was nearly 30 feet tall. 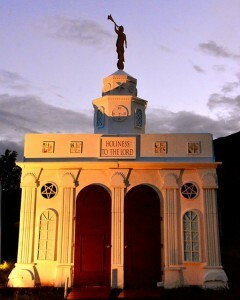 Many of their ancestors had assisted in building the original temple at great sacrifice. Then, just as happened in the 1800’s, not long after the temple was completed, the mobs came and they were forced to leave their city and their temple. 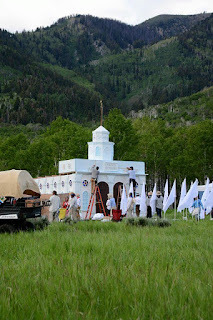 The youth loaded their belongings in handcarts and, over the course of the three days, pulled those handcarts 16 or 17 miles through the mountains above Heber. It was not all drudgery though, as the youth ate well, made friends, and of course deepened their appreciation for what their ancestors must have experienced. Through it all, the youth realized what it must have meant to build such a beautiful city and temple and then have to see it destroyed and have to leave it. And, although the youth only pulled these handcarts a small portion of the 900 miles the real pioneers pulled them, they definitely came away with an appreciation of the conviction and testimony these early pioneers must have had to endure the trials they did so faithfully.